Akhil From Hounslow: Return Of The King? I have read many opinions on why we should or should not sign Thierry including many opinions from friends I go to games with. The argument of wanting to remember Thierry at his peak or not ruin his legacy is a fair one but I for one would risk Thierry’s legacy for a top four finish. I love Thierry; but I love Arsenal football club more. Saying all that, I would much rather get that permanent striker in which will mean more support for Robin and perhaps show the ambition that Robin wants to see. But even getting a permanent striker may prove difficult; a potential player will know he will play second choice to Robin and its not like we can pay them 200k to sit in the bench (unlike some; some even pay others to play for someone else but we will leave that for another day). It’s a real dilemma. Podolski has been rumoured and that would provide a much longer term option and I would be happy enough with that. The downside to a short term replacement is that when March/April comes, Arsenal will need fresh legs and the Podolski type signing can give that where as the Thierry Henry signing cannot. Being in the away section at Man City, I would have given anything to have Thierry Henry on the bench and bring him on for the last 20 minutes or so. He just offers something different and I know it was only pre-season but he did not look too shabby in the Emirates cup and has been training with Arsenal so only the club know what level he is at. The other issue that is talked about is what sort of impact this may have on current captain and star man Robin Van Persie. I believe Thierry is a smart man, and a smart man will know he is not the player he once was and knows he will not be the star man. Thierry Henry is not here to replace Robin Van Persie, Thierry Henry is not here to play in Robin Van Persie’s position, Thierry Henry is not here to return as captain. Thierry Henry is here to literally lend a hand when needed. An Ideal solution would be to bring Thierry in along with a long term permanent offensive player and one that most would be very pleased about. I know the romantic and emotional personalities among us do not want to see Thierry reputation tarnished but I would be prepared to take the risk if it gives an advantage to Arsenal football club. After all; how can anyone forget Thierry’s 226 goals for this football club and in case you do forget, there is a massive statue outside! well balanced article. it is a dilemma for sure but the club should ALWAYS come first. 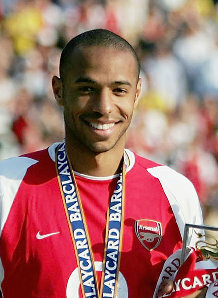 i love Titi to bits and no matter wat happens in these 2months he will always be a legend. but like u said, he has to be smart enough to know that he'll be playing second fiddle. i just hope this does not disturb the team dynamics and start hearing stories about how some players were afraid to make mistakes when playing with Titi in his final season. Thanks mate. I agree with your comments too. I think in that final season, it got a bit too much with Thierry and as you said, players were worried and passed to him even when they were in a better position. Now, its a new fresh team so I dont think it would happen again.